Supports muscle and cardiac function. Nobel prize-winner Professor Susumu Tonegawa was responsible for the first study on magnesium L-threonate, a magnesium salt of L-threonic acid which is a natural metabolite of vitamin C.
¤ It has long been suggested that magnesium might play a role in memory and cognitive function. Unfortunately, the normal transporters of this mineral do not readily cross the blood-brain barrier. Scientists at the Massachusetts Institute of Technology (MIT) have discovered that a unique compound called magnesium L-threonate, produces significant increases in magnesium concentration in the brain. Density of synapses, the connections between brain cells that are vital to learning and memorising capacity, is linked to age. The researchers hypothesised that supplementing with magnesium L-threonate might improve learning, working memory as well as short- and long-term memory. ¤ The first conclusive tests, conducted on rats, showed a significant increase in the density and plasticity of synapses in the hippocampus, the area of the brain responsible for memory. A 19% improvement was recorded in the elderly animals’ ability to memorise. In tests on spatial memory (retracing a route in a familiar environment) the improvement was even greater at 100% ! The study also showed that density of brain synapses decreased considerably when administration of magnesium threonate ceased. ¤ A human study is currently underway at the University of Southern California involving around 40 participants; preliminary results will be available in a few months. This early research paves the way for other studies to evaluate the effects of magnesium threonate on preventing Alzheimer’s disease and dementia as well as its potential for treating other age-related problems. ¤ More recently, it has also been found to have a beneficial effect in the prevention of androgenic balding. Given the results of animal studies and the safety of this 100% natural compound, which is well-tolerated at the doses suggested, the use of magnesium L-threonate can now be recommended for boosting magnesium levels in the brain, increasing density and plasticity of synapses and improving associated cognitive ability. Other ingredients : magnesium stearate, silicon dioxide, microcrystalline cellulose. Adults. Take 2 capsules morning and evening. 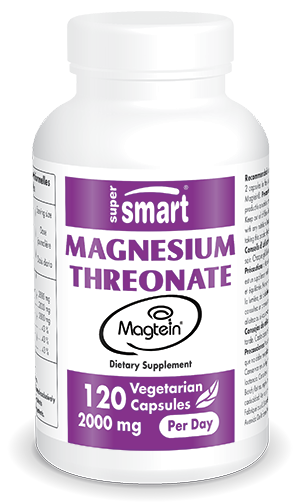 Each vegetarian capsule contains 500mg of Magtein™.